What causes a total solar eclipse? Learn about the basics of solar eclipses so that you can understand the spectacle of the Great American Eclipse on August 21, 2017. This single fact explains why we see total solar eclipses - the Moon has an apparent size that just barely covers the Sun completely, yet is not too large that the Sun's atmosphere, its corona, is eclipsed as well. We on Earth occupy a celestial sweet spot to witness this sight. It was not always so. When the Moon first formed around our Earth over 4 billion years ago, it was much closer to the Earth and appeared much larger in our sky. So total solar eclipses in the early epochs of our Earth did block the Sun but also most of the corona. Over the eons, the Moon is gradually receding from the Earth due to the friction from the tides. At present, the distance from the Earth to the Moon increases by about an inch per year. In some distant future epoch, the Moon's disk will become smaller such that no more total solar eclipses will be visible from Earth. Depiction of the umbra and penumbra at a moment of time during the 2017 total solar eclipse. What are the umbra and penumbra? When you read about eclipses, the terms umbra and penumbra are frequently mentioned. These are the two types of shadow cast by the Moon. The umbra is the inner shadow. If you stand inside the path of the umbra, the Sun will be completely blocked in eclipse. The penumbra is the outer shadow. If you are outside the path of the umbra but inside the broader eclipse area, you will only see the Sun partially eclipsed. While the Moon and Sun have nearly the same apparent size in the sky, their apparent sizes do slightly vary because of two factors; the Moon is in a slightly elliptical orbit around the Earth and the Earth also revolves in a slightly elliptical orbit around the Sun. This variation results in the circumstance that sometimes the Moon's disk does not completely cover the Sun's disk during eclipse. These are annular solar eclipses and a prominent example of this eclipse type occurred in the United States on May 20, 2012. The next annular solar eclipse will visit the United States on October 14, 2023. While an annular eclipse is a striking sight, it does not command the same overwhelming sense of wonder that a total solar eclipse does. Daytime is dimmer but not twilight. Because some of the Sun's disk is still visible, it is much too bright for the Sun's corona to become visible. It is never safe to look directly at an annular solar eclipse, even at its maximum phase. If the Moon's shadow is not centered on the Earth, then another and common type of solar eclipse occurs, the partial solar eclipse. 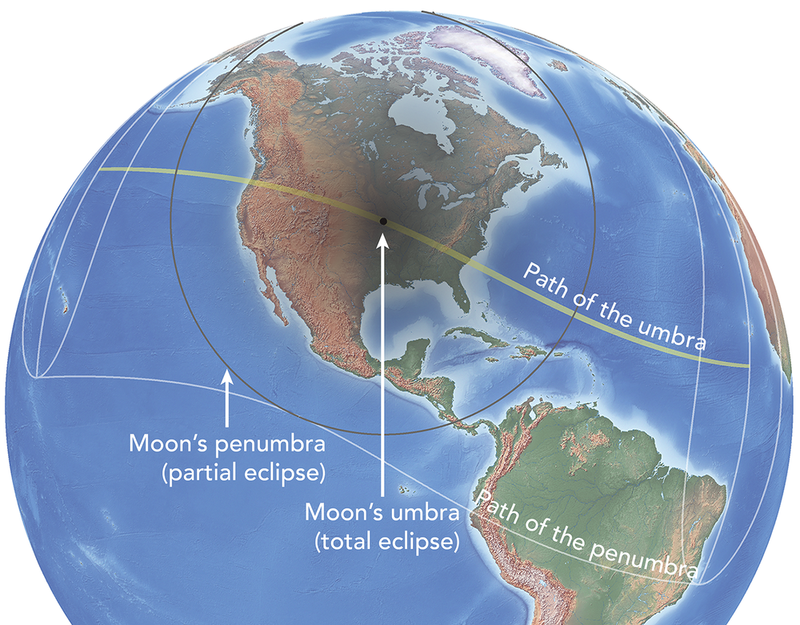 During a partial solar eclipse, the umbra misses the Earth and from everywhere the eclipse is visible, you will only see part of the Sun eclipsed. Again, at no time during a partial solar eclipse should you look directly at the Sun without an approved solar filter or a pinhole projection. Why doesn't a solar eclipse occur every month? 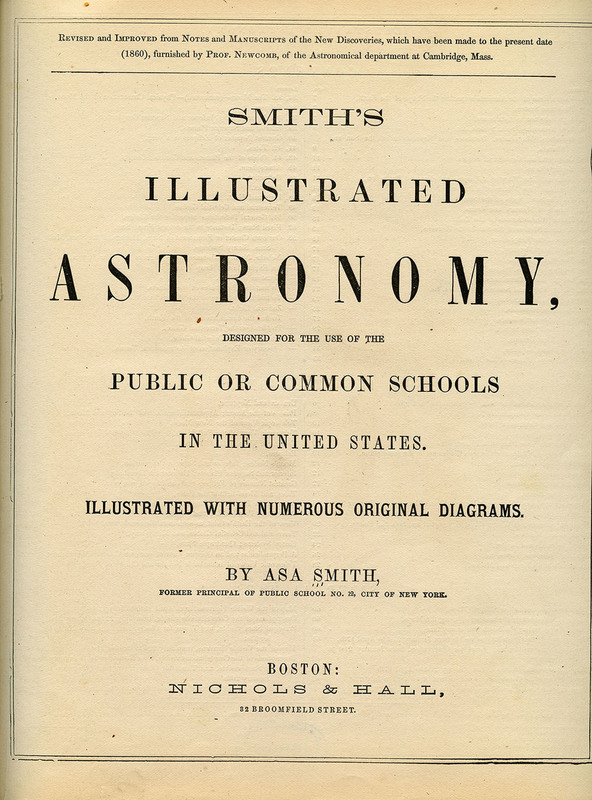 Detail from Smith's Illustrated Astronomy, 1855. If the orbit of the Moon were exactly within the same plane as the orbit of the Earth around the Sun, then total (or annular) solar eclipses would occur every lunar month. However, the orbit of the Moon has a tilt of about 5 degrees with respect to the Earth's orbit around the Sun. 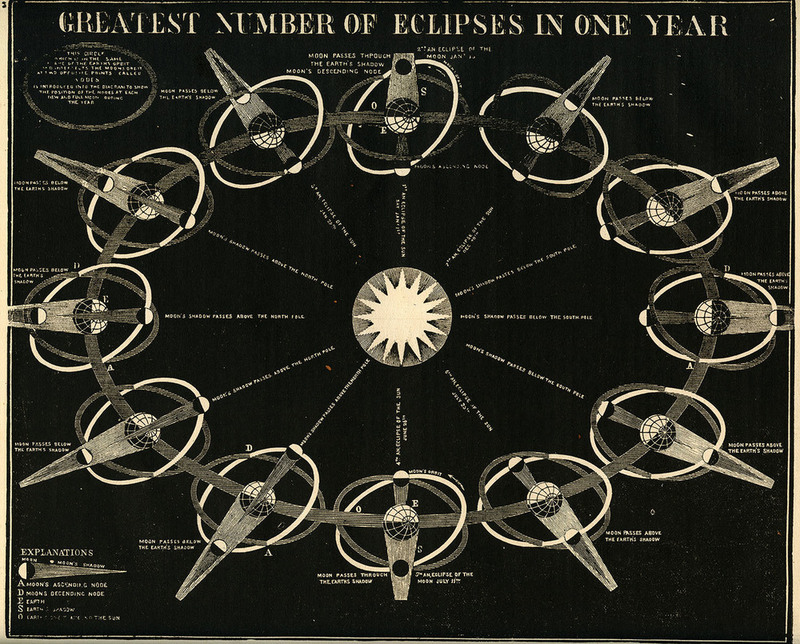 This diagram published in the 1855 book by Asa Smith, Smith's Illustrated Astronomy, shows that because the nodes of the crosses of the orbit remains fixed throughout the year, there are two times during a year that are most favorable to a total solar eclipse. You can learn more about the motions of the Sun, Moon, and Earth and cycles of eclipses at the essential eclipse website MrEclipse.com. 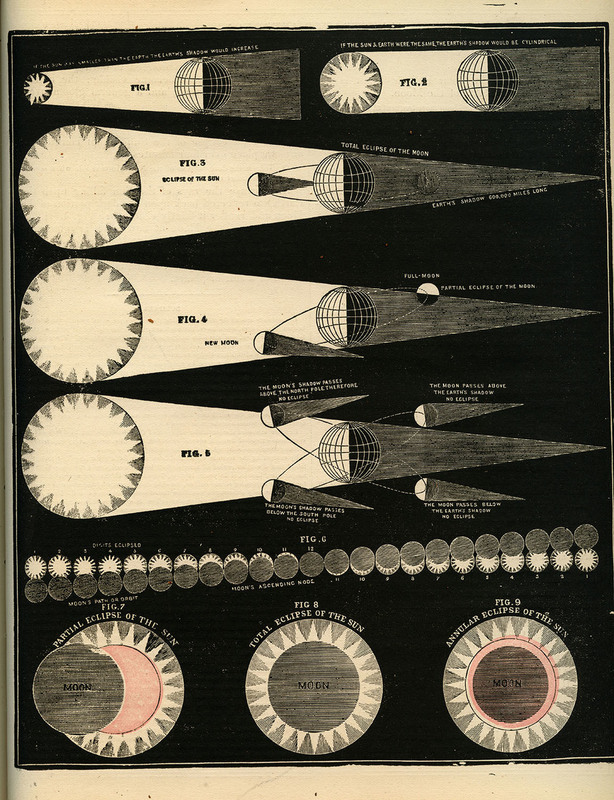 You can examine more of the excellent eclipse diagrams from Smith's Illustrated Astronomy in the gallery below. Although published in the 19th century, these attractive diagrams still have the explanatory power to make eclipse concepts clear.